At what temperature setting is your unit operating at? This is an important thing to consider if you want to cut on the energy cost in running your air conditioning system. If you set the temperature too low in summer months, you’ll be overworking the unit, and it will require more electrical power to deliver the set temperatures. The best setting you should have for the summer months should be 24°C and anything below that will cost you more power to maintain. For the winter season, it should not be above 19°C. If you can manage to reduce the amount of heat getting into your house, then you’ll be able to cut on the energy cost significantly. Introducing shades would be the perfect way to reduce the workload off the air conditioner. You can go for the curtains, shutters, awning and shades for your windows. For instance, heavy curtains will help to keep the room warm by trapping warm air inside. This will also cut on the amount of energy needed to keep the room warm in winter. Similarly, shades will reduce the amount of heat getting into the house, and this will see a significant drop in the electrical needed to keep the room cool in summer. The condition of the AC unit substantially determines the amount of energy it consumes in order to operate optimally. If the AC is not given proper maintenance, its efficiency falls, and this will make it consume more power to keep the room cool. For instance, if the filters will become dirty. This will force the unit to work harder, and meaning that more electricity will be consumed. Regular air con maintenance will help in maintaining the unit’s high efficiency so that less energy is consumed to keep the room cool. For proper functioning of the system, you should schedule an annual maintenance. Combining the use of a ceiling fan with the air conditioner can also help in reducing the amount of power that the AC needs to keep the room cool. The fan will circulate to cool the air, and this will take some of the burden off the AC unit. If you don’t have ceiling fans, it would be great to have them this summer, and you will see their long-term economic benefits. They also work to increase the energy efficiency in the system. This is another area that you can make a lot of savings on your energy bills. The question you need to ask is whether you need the same temperature regulation while sleeping? Well, the answer is no. 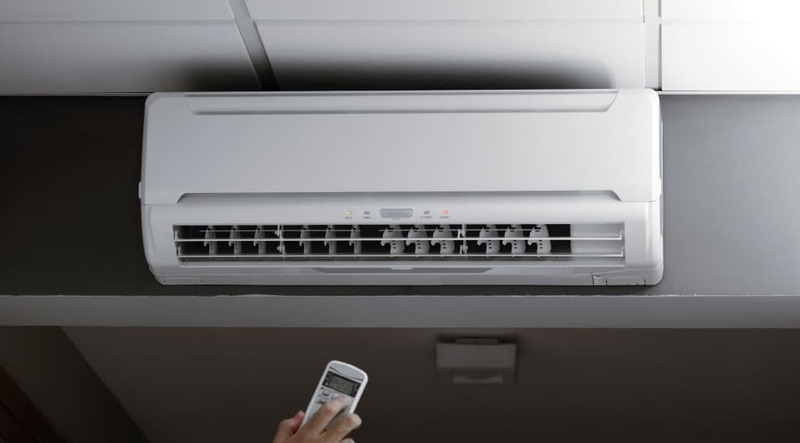 You can raise the AC temperature in the summer, and this will reduce the amount of power consumed by the unit at night. In a winter night, do the opposite. It’s hard to notice temperature changes while sleeping but the difference will be seen on your energy bills. Most of the newer models have some innovative energy-saving features like motion sensing to further reduce energy costs. Filters are some of the most sensitive parts of the AC units, and their effectiveness is crucial to the overall efficiency of the system. Air filters prevent the debris, dust and other from blocking the vents for proper air circulation. If the filters become dirty or clogged, the efficiency of the unit is lowered, and the system tends to overwork or work harder. This makes the system draw more electrical power to regulate the temperatures in the room. It’s important to replace the filters after every few months especially if vegetation surrounds the outdoor unit. Filters are cheap and won’t cost you a lot to replace. This is another trick that will work to keep your air conditioning bills at the lowest amount possible. Cooking indoors adds more heat in the room, and the AC unit will need to work harder to keep the room cool. Outdoor cooking would be the perfect way to reduce the load off the unit, and the difference will be reflected on your energy bills. Most people think that windows are the only parts of their home or office that leak air but that’s not true. Walls and attic are also parts that you need to work on if you want to regulate the heat getting and out of your house. Hire the professional to insulate your home to increase the energy efficiency. This is an idea tip especially the old homes since it also works as a renovation project that will also enhance the aesthetics of your home. Sometimes, you can keep the unit off if it’s not needed to keep the room cool. Sometimes, the weather might be cool, and opening windows will be enough to cool the house. For instance, the nights would be the perfect time to shut down the unit and allow for the natural cooling of the house to take place. If it’s an office AC unit, if there are no operations during the night, it will be economical to turn it off all night. Solar power is the cheapest way to run your AC unit. It will only cost you to install the system, and then you’ll enjoy air conditioning services at no cost for a very long time. It’s important to note that a good solar power system will serve you more than 25 years and thus the economic benefits are immense.